The one and only: Husbys Food & Spirits and The Garage @ Husbys. Great food at affordable prices. 12 flat screen TVs, Happy Hour 4-6 daily, large beer selection, pool and bar games, major league baseball package. 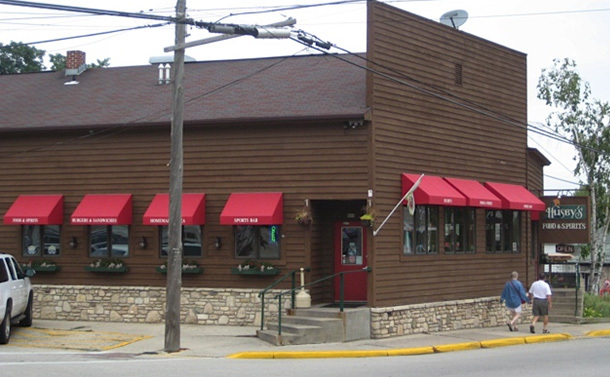 Serving lunch and dinner with outside seating, nightly specials, kids menu and Friday night fish fry. Available for private parties and open year around 11 a.m. - close. Wheelchair accessible. Featuring live entertainment in season. Everyone welcome! Nov-Apr, kitchen open Su-Th 11-9, F-Sa 11-10.